Light, chewy and fluffy pumpkin filled sticky roll skillet cake topped with a tasty cinnamon and cream cheese flavored tahini frosting. 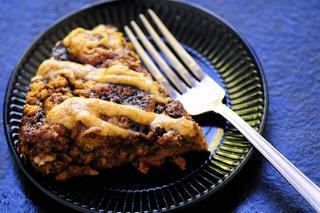 This decadent and delicious dessert makes a delightful gluten-free autumn treat! If you're looking for a bit of gluten free indulgence this autumn, look no further . . . This gluten free pumpkin sticky roll skillet cake is chock full of pumpkin spice flavors with an out of this world light and fluffy texture - much like a cinnamon roll! Top it off with a creamy, delicious cinnamon tahini cream cheese icing and you're talking about one heavy duty autumn treat! If you're in the mood for something tasty & sweet that you would never guess is gluten free, this is most definitely it. It makes a mighty fine way to impress your guests, too! In a large mixing bowl dissolve yeast and sugar in warmed milk.Let sit for 5 minutes or until slightly frothy. To your yeast mixture, stir in pumpkin, butter, vanilla and egg until smooth.Slowly sift in tapioca and buckwheat flours, followed by baking powder, xanthan or guar gum, salt, and baking soda. Mix until a smooth batter forms.Transfer to a greased mixing bowl, cover, set in a warm & dark place and let rise for 1 hour.Preheat oven to 400°. Grease a cast iron skillet or cake pan, set aside.Cover a cutting board with parchment paper. Flour the surface well.Remove cake batter from bowl and place on floured parchment paper.Sprinkle batter and rolling pin liberally with flour.Roll out until you have a square shape roughly 1/2" thick.Combine all filling ingredients, mix until smooth.Take 1/2 of your filling/topping mixture and spread over your cake batter square. Using a sharp knife, cut your dough into 8 strips.Roll and twist each strip until you have a very rustic cinnamon roll like shape (this will be messy and that's okay! ).Place each rustic sticky roll into your greased skillet or pan, making sure each roll touches the next forming a round cake like shape.Pour remaining filling/topping mixture over your rolls.Place into your preheated oven and bake for 20 minutes.While your cake is baking, prepare your icing.Whisk together all icing ingredients until smooth. If it's too runny for your taste, you can refrigerate until it hardens slightly.When your cake is done baking, remove from the oven and let cool for 10 minutes, or until ready to eat.Place your icing into a piping bag or ziploc with the corner snipped off and squeeze over your cake in design of choice, or simply spread your icing over cake with a knife.Enjoy!